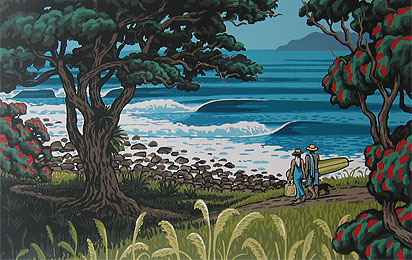 Tony was born in 1959 and has devoted over twenty years to making fine art prints and paintings about New Zealand. He has been inspired by locations that are off the beaten track, mostly untouched niches of the land and coastline that convey to him an unchanged timelessness. To capture that "sense of place" is what he strives for in his work. 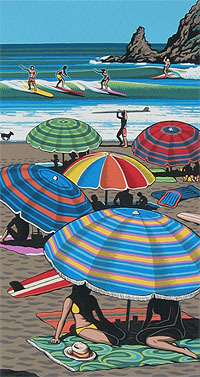 His screenprints have become more technically complex as he continues to produce bright, colourful records of familiar beaches, landscapes, and the ubiquitous kiwi bach in his art works. He successfully depicts the essence of the New Zealand landscape, and these images are popular with a wide local and international audience. Tony has been surfing for more than 30 years and has recently devoted a large portion of his working time to the painting of this much-loved activity. 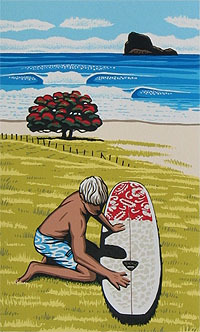 The launching of his new website Aloha Piha will bring his Fine Art Print Making to a wider audience, appealing to those who also share a passion for Art and Surfing. 'Screenprinting allows me to express my love of the New Zealand landscape and ocean environment with strong colours in a direct and graphic manner'. 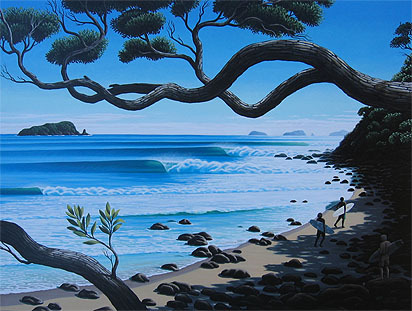 The evolution of this style has consequently made Tony Ogle a thriving artist producing bold renditions that portray the essence of New Zealand. Tony lives and works at Bethells Beach, on the West Coast of the North Island, near Piha, a very famous surfing beach in NZ. He shares his life with his wife Elena and their sons Luke and Jamie.